What Can Olive Branch I.T. do for YOU? We don’t just call ourselves “experts” for fun. We ARE experts, and being experts, we understand not only how crucial information technology is for your business, but we understand the ins-and-outs of that information technology, from how it’s set up physically, to how it functions daily for you and your employees. In the event that your system crashes, we are here. But, we consider ourselves to be a step ahead of the game, with our knowledge, our constant research, and our pro-active technology mapping, we are able to assist you in preventing that failure by constantly staying on top of changes in hardware and software, BEFORE they even get released to the open market. With that said, one thing we can’t and won’t do for you? Sell you something you don’t need. We don’t waste your time and money, because OUR time and money is valuable. We assess your situation and needs, and derive a plan that makes the most sense for you. We review your expectations as a business and as an individual and make qualified suggestions based off what we view as your most profitable investment. We will design, install and maintain the newest, fastest, most secure, and cost-effective IT system for your business or corporation. But, we don’t just stop there! Once that is finished, you can rest assured your system will be maintained, as we provide complete technical support to all users of the network. It’s like having a technical guardian angel in your pocket. “But wait, I’ve got my system set up. What else can you do for me?” Oh friend, the train doesn’t stop there. That? Is just the beginning. We will talk with you about your system, and about the level of satisfaction you have with it. We will look at what's going on, and help YOU decide if your network is working for your business, or if your business is working for your network. We will make suggestions, but ultimately? You make the decisions. 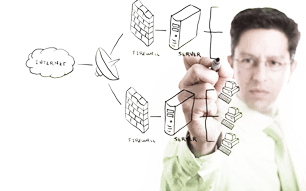 We are experts in mail-server setup, backup/ recovery, troubleshooting, and system security. Want your own mail server on site? Done. Want your emails backed up? Done. Want your employees to have easy access to company email? Can you guess? Yep, Done. Computer Crashed? Stop right there- DON’T throw it! We know, it’s tempting. But, we got this. And that bank account on an island you’ve never heard of? Relax. Your financial information, as well as your customers financial information, is safe. We will make sure your system won’t be compromised, and we are constantly running the latest in spy-ware and mail-ware protection, which get continuously updated as new threats are identified. And all that? Is just an “idea” of what Olive Branch can do for you. Call us today to request a quote. Because with Olive Branch I.T., solutions are just one single click away!